Community Professional Loudspeakers has expanded its I SERIES family with the new IV6 Modular Vertical Array 600 system. The IV6 features wide-dispersion IV6-1122 array elements (12-inch, two-way) available in two complementary vertical coverage angle versions (5 and 15 degrees). Up to 5 degrees of splay between elements eliminates excessive overlap or coverage gaps, overcoming the physical limitations and acoustical tuning difficulties of conventional line arrays and constant-curvature arrays, while maintaining the best qualities of each in long-throw line arrays, medium-throw progressive curvature arrays, and compact constant-curvature arrays. The single 18-inch IV6-118S subwoofer can be flown above or behind any array to provide additional low frequency impact. Built-in Passive Acoustic Optimization (PAO) settings on the rear of each loudspeaker allow up to 55 different frequency response profiles to be independently selected for each element in the array, providing high SPL and consistent frequency response throughout a listening area without additional amplifiers or DSP channels. Community’s exclusive PAO module included within EASE Focus 3 software calculates the ideal PAO settings for each loudspeaker. Community has collaborated with audio rigging manufacturer Polar Focus to design a variety of color-matched array frames that integrate with Polar Focus’ wide variety of install-friendly, array-to-structure hardware. IV6 loudspeakers are available in textured black or white finishes for indoor applications, and may also be ordered in weather-resistant versions featuring Community’s exclusive PolyGlas enclosures and optional powder-coated stainless-steel hardware for outdoor applications. 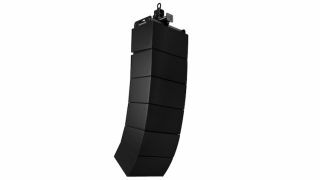 Designed for installed indoor or outdoor applications, IV6 is a scalable, adaptive sound reinforcement system. All IV6 loudspeakers are made in the USA at Community’s headquarters in Chester, PA and will begin shipping in January 2018. AVNetwork is part of Future plc, an international media group and leading digital publisher. Visit our corporate site.